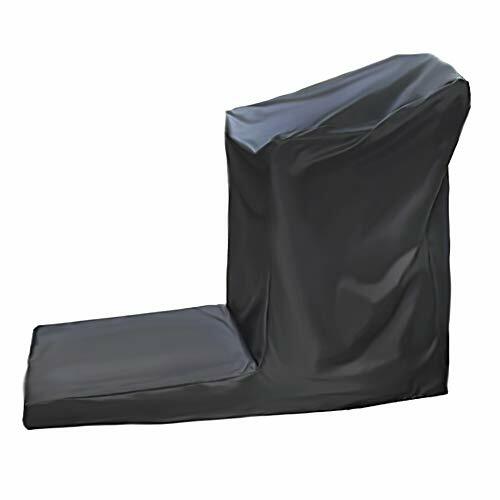 Product Name: Folconauto Treadmill Cover Running Machine Cover Dust Cover Waterproof and UV Resistant Cover Oxford Fabric Furniture Cover. 81'' x 37'' x 67'' / 206cm x 94cm x 170cm. Made of amazing hydrophobic material and bound edges give full protection for the cover from cracking. The parasol cover features UV coating, so it can help prevent damage from the strong sunlight, ideal for outdoor use. Waterproof PVC layer make it more durable and not easy to fade, tear through rain, wind and intense sunshine. There is an adjustable hem cord on parasol cover. Keep parasol cover secure on the parasol, so that the parasol cover will not be blown away by wind. Suitable for running machine, treadmill, fitness equipment outdoor and indoor, and the cover also applies same shapes equipment smaller than the covers size, protecting your running machine, fitness equipment, furniture from the rain, wind, sand storms, UV and etc. 1.This cover has drawstring at bottom, which can help tighten cover and prevent the cover from being blown off. 2.Easy to clean and storage: Simply wipe with a damp cloth and dry it in the sun; Comes with a storage bag for storing when not in use. Package included: 1 x treadmill cover. Refund or Return Guarantee: Folconauto is committed to providing the most affordable products and the best service. If you have any problems after purchasing the goods, please feel free to contact us and we will give you a satisfactory answer within 24 hours. Material: 600D Oxford Fabric. Water-proof and dust-proof. Size: Length*Width*Height: 65'' x 30'' x 55'' / 165cm x 76cm x 140cm; 73'' x 36'' x 61'' / 185cm x 91cm x 155cm; 81'' x 37'' x 67'' / 206cm x 94cm x 170cm. Application: Suitable for running machine, treadmill, fitness equipment outdoor and indoor, and the cover also applies same shapes equipment smaller than the covers size, protecting your running machine, fitness equipment, furniture from the rain, wind, sand storms, UV and etc. If you have any questions about this product by Folconauto, contact us by completing and submitting the form below. If you are looking for a specif part number, please include it with your message.